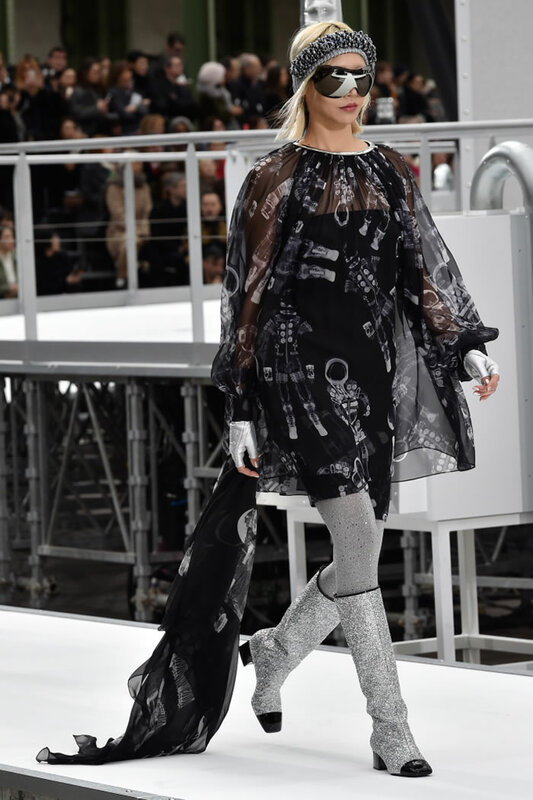 By now, everyone knows that for his Chanel show on Tuesday, Karl Lagerfeld installed and then launched a giant rocket (35 meters/115 feet high) inside the Grand Palais. (No, it didn’t break through the dome; even he couldn’t get clearance for that.) It was quite literally awesome, and (Virgin Galactic’s efforts aside) as close as most in the audience will get to real space travel. Extravagant? Absolutely. Some would say excessively so, especially as what becomes of a decommissioned Chanel spacecraft? 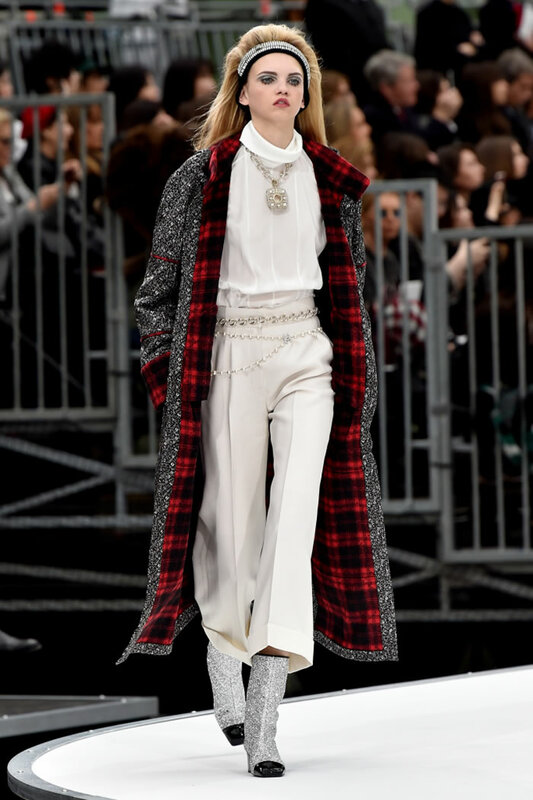 But it sent a message loud and clear: Chanel is first, foremost and unapologetically a luxury house. 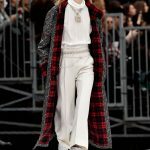 Let other brands pursue the lure of streetwear; Lagerfeld has done it at Chanel, but always tongue-in-cheek and certainly never, ever intended to look like actual streetwear. Creating distinctive luxury product that looks like luxury product has surely worked for him and the house, as one can see anecdotally by the legions of pan-generational clients who turn out for the shows, particularly couture, bedecked in all their tweeded glory. Fake proletarian style? Non, merci! Those women do want newness, as in new versions of the signatures they crave and collect. 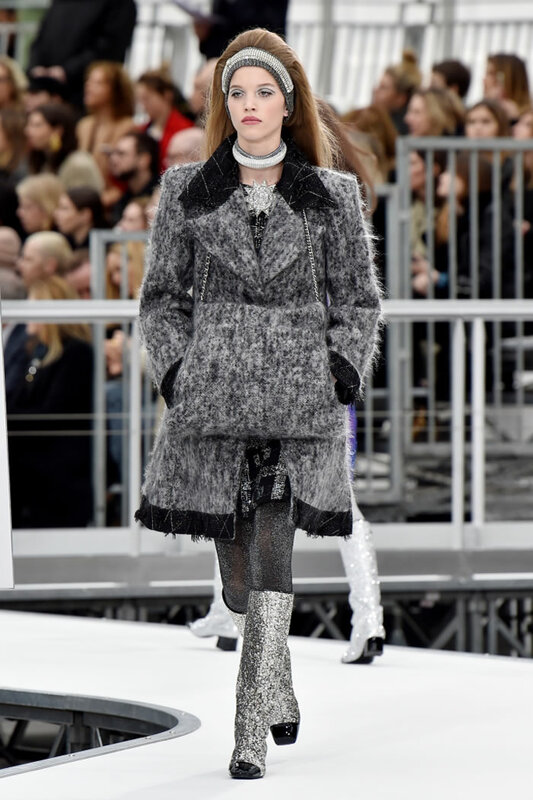 This time, Lagerfeld delivered with a soupçon of a space motif, but arriving guests looking at the rocket and anticipating Karl-does-Courrèges were oh so wrong. “There’s going to be space clothes, but not silly like the Sixties,” he said during a preview. Rather, fashion’s new “Rocket Man” (the finale song) let his fabrics do the soaring. 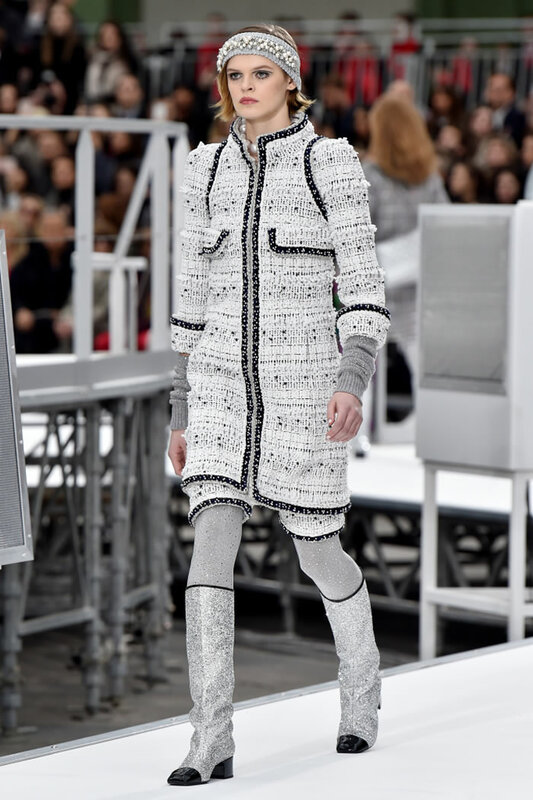 With their richness and density, Chanel tweeds make the perfect material for otherworldly allusions night sky, surface of Mars, Milky Way? Sure. That meant countless incarnations, many rendered all sparkly starry via Lurex, sequins and crystals. There were also leathers in moon-walk silver and deep aurora borealis hues. 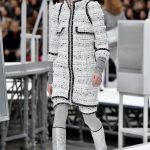 Overall, the color palette went two ways white, gray and silver with black, in homage to the standard astronaut regalia (particularly that of Frenchman Thomas Pesquet), and rich darks red, navy, purple derived from various planetary surfaces, according to Karl “Sagan” Lagerfeld. These were used for a lineup of characteristically chic suits in multiple incarnations. Dresses were plentiful as well, from stiff and straight to curvy. Sometimes Lagerfeld added the dash of walking shorts underneath. Trousers cropped at the ankles offered a smart shot of sportif. As for more overt thematic references: an amusing astronaut print and some wacky head wraps that looked like quilted Mylar. 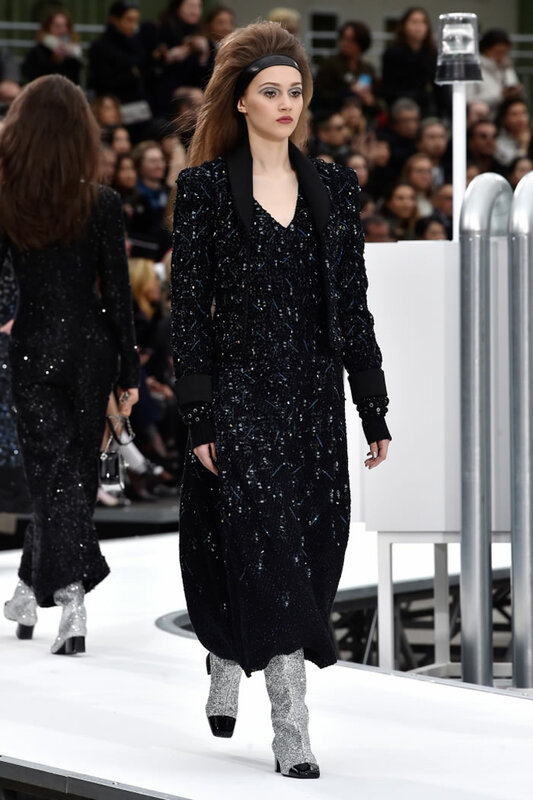 Almost everything was worn with step-lively, low-heeled glitter boots.